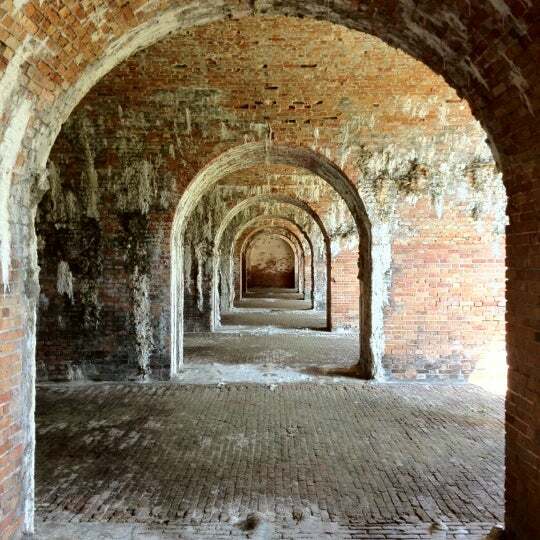 Just a mile down the Peninsula is the Historic site of Fort Morgan. Plan on spending a few hours taking it all in and immersing yourself in the stories of the Fort throughout the years. I recommend that you start in the Museum and learn about life in the Fort before you go venturing down the tunnels and turns of the multi layer Encampment. Learn about the Big Guns that stood in defense of our coast line that could fire a 1046 pound shell over 8.5 miles! My favorite thing is to really look at the detail of the walls and wonder what it was all for. There are old overhead rail tracks that they used to move the ammunition around on trolleys and small windows here and there in the walls that I have yet to formulate what for. But I will come up with an answer or maybe you can help me figure it out. Keep your eyes open and let the walls and floors talk to you as you go deeper into the Fort interior via the many connecting passageways. Imagine being a soldier standing with musket in hand peering through a small slot in the brick wall ready to defend your position or turning the cannons to aim at the incoming attack. You can still see the grooves and indentations in the floor from those very cannons. Once you have covered the Fort head out for a drive on the old airfield and visit several other buildings and read the plaques that tell their story as well. The grounds are well-kept and there are a lot of stairs to truly get into ever facet of the Fort, but you can still explore the majority without climbing too many steps. Check the calendar and you can see demonstrations as we caught them firing the muskets in the Fort courtyard once and that was very impressive. Our family loves the “Little Zoo That Could” so much. I call it a grown up petting zoo because you are up close and personal with the animals. There are no hills to climb and the property takes you in one big loop around the Zoo. “Hurricanes, tropical storms, the recession, the oil spill. We aren’t called The Little Zoo That Could for nothing. We are definitely survivors, but it’s time to move to higher ground and become The Little Zoo That Grew,” said Patti Hall, Zoo Director. The Zoo is in the process of building a new location and you can see updates on their Facebook page. Where else can you hold a baby kangaroo, sit with sloths, play with lemurs, or hold a baby alligator? Plan for about 2 hours of time to walk the zoo and take your time. It is definitely worth the family visit and in 2017 others agreed. The Zoo was the highest ticketed attraction in Baldwin County and welcomed more than 175,000 visitors. We are Annual Pass holders and go as often as we can. Below is a video we caught of a Lion interacting with his Keeper. Ranae and I fell in love early in life. We started talking on the phone as Freshmen in High School and finally met face to face three years later and then engaged the next month after that. Yeah I know!! We got married Labor Day weekend after Graduation and immediately started creating our family as Ranae became pregnant one month after we married. So much for being Newlyweds! Our family continued to grow as we have three daughters and now two grand kids. Growing up and living in Southern Indiana was great, but we always yearned to be closer to the Beach and took every trip we could to enjoy the sand and water with our little family. Every couple of years we would talk about packing up and moving to the Beach life only to change our minds when it became real. Well finally in October of 2017 we took the PLUNGE and moved to Foley, Alabama 14 miles from the Gulf Shore beaches. HAPPY WIFE—-HAPPY LIFE!!! So she convinced me (it really didn’t take much effort) and here we are. The 30th anniversary is supposed to be Pearls, but we made it beach and sand by purchasing this dream condo and now sharing it with you. We hope you feel the love and attention to detail we put into making this retreat a place to relax, recharge, and make lifelong memories with. So enjoy and here’s to 30 more Ranae– I love you more! WE CLOSE ON THE BEACHFRONT CONDO IN LATE SEPTEMBER AND THEN WILL BE UPDATING IT DURING OCTOBER. WE HOPE TO HAVE EVERYTHING READY TO RENT FOR YOUR VACATION BY THE FIRST OF NOVEMBER . Please like and share our page and help us get the word out.